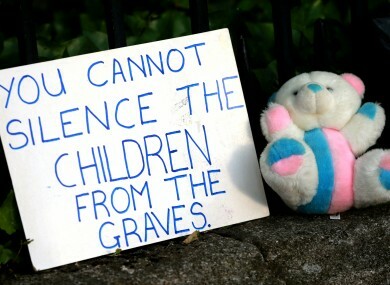 A protester's placard outside Leinster House after news of the Tuam graves was broken. THE HISTORY OF mother-and-baby homes in Ireland is to be investigated in a French documentary. So far, only one priest has agreed to be interviewed for the programme, despite numerous requests made of religious figures. The documentary, which is being made by France 2, came to light after a letter from Terry Prone to one of its makers, Saskia Weber, went public. Prone’s letter was sent to Weber in response to a request for an interview with Sr Marie Ryan of the Bon Secours sisters, for whom Prone is a public relations representative. Speaking to TheJournal.ie, Weber said that this was not the only negative response that she had received while trying to arrange interviews for the documentary. Weber said the documentary is about the mother-and-baby homes, and will focus on different individuals, such as Derek Leinster of the Bethany Home, and also a person who was born in the Tuam home, and a mother who was in Bessborough in Cork. We’re trying to explain about all the system and to understand how all this happened and what for, and for how long… how did it last for so long. “I’m focusing making the investigation around the Tuam story and around this, then little by little I pull the threads and try to explain the whole system, what was the Magdalene Laundries, how many, what happened to the babies,” said Weber. Weber had said she was “shocked” to receive Prone’s letter. She said that she received a negative response from all the dioceses she wrote to requesting an interview, being told that some bishops were busy, and others were not available. In Tuam, she went outside a mass to try and speak to a priest directly to request an interview, but said that she was told he was going abroad and did not have time. “I said at least for these 800 babies can you give me two minutes interview,” said Weber. “I was disappointed,” said Weber of this reaction. “Because I’ve looked and read many documentaries about it. Every journalist in Ireland says they couldn’t get contact from anyone in the church clergy. So I wasn’t hoping that much.” But she thought that as she works for a foreign channel there was a possibility of getting some interviews. One priest agreed to an interview: Fr Peter McVerry. She spent more than two hours talking with him. Weber also interviewed journalists, historians such as Catherine Corless – who discovered the Tuam babies site – and archaeologists. “I’m still hoping some Bishop will talk to me,” said Weber. She has requested an interview with Deputy James O’Reilly. She is also hoping to find out if there will be any exhumations or anything done with the site, and for the terms of inquiry to be announced. Weber said she finds it “difficult to understand how a society or government can be so indifferent to” children. Weber said that the issue of mother and baby homes won’t be a new one for French audiences. “The production company Sunset Press did a first documentary 16 years ago about the Magdalene Laundries,” said Weber. The documentary will feature an interview with Derek Leinster. Derek was born in the Bethany Home, which was run by Evangelical Protestants, and said that he suffered neglect while there. He is a member of the Bethany Home Survivors’ Group, who are long-time campaigners for recognition of the conditions children lived under in the home, and also for redress. The home is not included in the list of homes that is part of the State’s redress scheme. Leinster said that as part of the filming, they visited the site in Mount Jerome cemetery where a memorial has been erected in honour of over 200 children who died in Bethany Home and were buried in an unmarked grave. The 52-minute documentary will be shown on France 2, a French public channel. It is hoped the documentary will be concluded by the end of the year, and they will then try to sell the show on. It is not known yet if it will be shown on Irish television. Email “Just one priest agreed to be interviewed for documentary on mother-and-baby homes”. Feedback on “Just one priest agreed to be interviewed for documentary on mother-and-baby homes”.